I am a knitter and a needle felter. My big season is fall – basically September to Christmas. Last year, I attended a LOT of art & craft sales in that period, and managed to end up with a repetitive strain injury in my right arm and shoulder from too much knitting and (especially) needle felting. As you may know, I did the Spring One of a Kind Show. What you probably don’t know is that going ahead with that show was hinged (seriously, I waited to give my final payment) on finding some sort of tool to help with the needle felting part (and some help from my mom with the knitting part) so that I did not injure myself further, and going to physiotherapy to undo the damage I had done in November and December. What I found after some research was the addi Quick electric needle felting tool, but it wasn’t available in Canada. So I couldn’t get my hands on it to take a look but I watched a few videos and read some reviews and figured it might do the trick. I bought it off eBay from someone in Germany and got through 2 months making all of the things for the OOAK Show with the help of it. 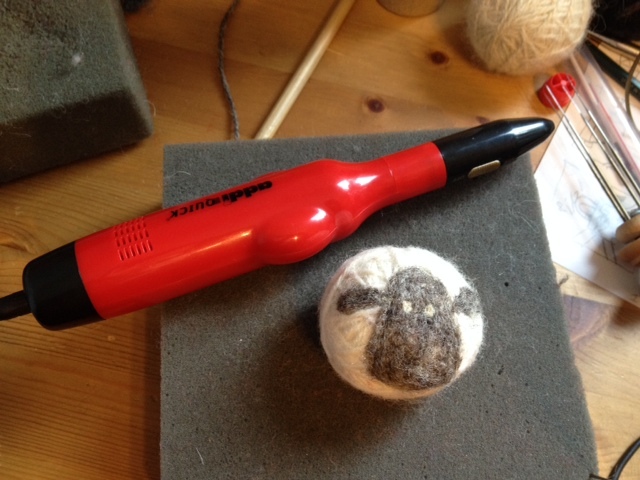 It does not go very deep so is not good for making 3-dimensional objects (like catnip balls and ornaments) and you still have to tack your embellishments (including the sheep and mice for which I used it) down by manually needle felting. It didn’t really cut that much time off but it saved my arm from a bunch of work. If you buy it from an authorized dealer (which I didn’t, because it wasn’t sold here at the time), it comes with a whopping 6 month warranty. I now know why it is so short. Basically, every piece that can possibly be made of plastic on it is, and within a month, I started having problems. But I read in a review (there is nothing in the instructions that come with the tool) to keep it greased, which helped a bit. After about 6 months of use (only 3 of which were heavy usage, I didn’t even pick it up in July), it broke. I took it to my MacGyver-esque mechanically & electrically-inclined husband with sad puppy eyes and he took it apart and had a look (see below). He could fix it but it was only a matter of time before it broke in some other place, he warned. 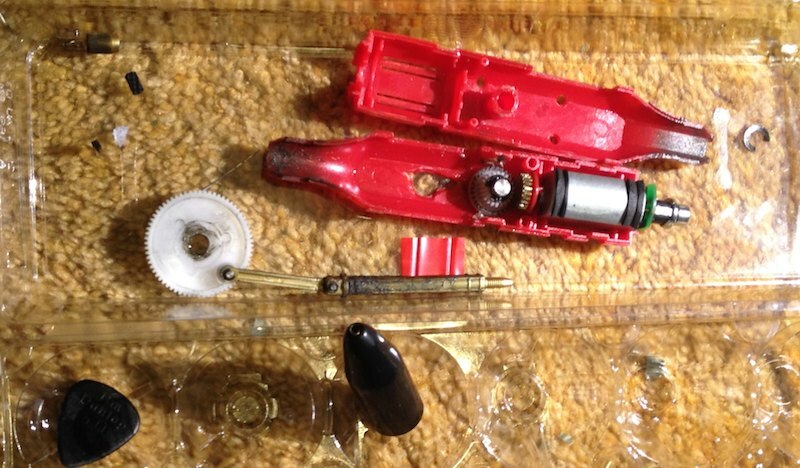 Here are the inside bits, after he had taken it apart (that gold bit attached to the gear is plastic, not metal). See how there is a piece of the red plastic actually broken off? 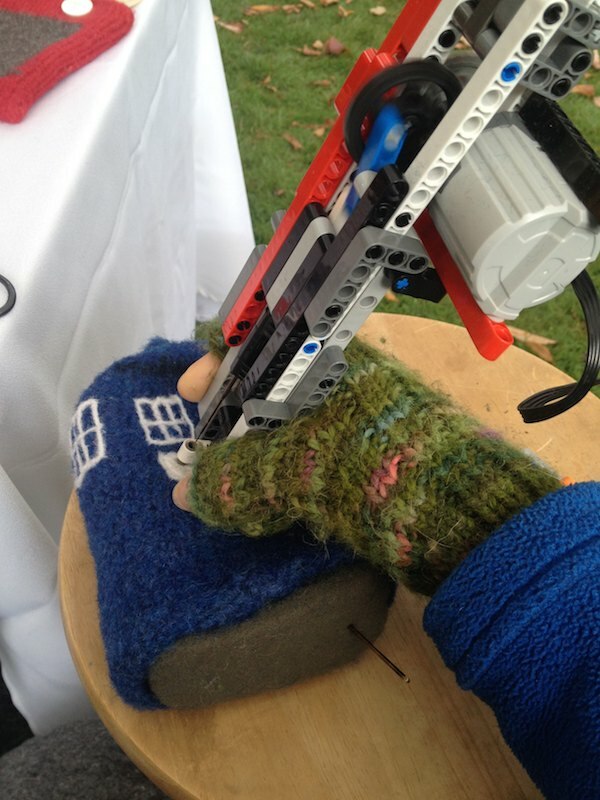 He fixed it with a small piece of Lego to keep it stabilized and glued it back together. Truly, what a relief that he fixed it because I had my busiest month ever in September, thanks to the awesome people of Toronto, who love to buy handmade and local. Thanks, Toronto! And thanks to the Cabbagetown Art & Crafts Sale, Danforth East Arts Fair, and the Etsy: Made in Canada MaRS team. The repaired addi Quick worked for another 5 or 6 weeks. And then it broke again. This time, though, the gold plastic part where you screw in the needle broke clear off with the part you screw it into attached. There’s no way to fix that, unfortunately. So I admitted defeat and went back to needle felting everything by hand. It took about 48 hours for my repetitive strain injury to rear its ugly head. So I went back to my husband and asked if there was REALLY nothing he could do to fix it (really: nothing.) and did some more research to see if there was anything else out there. Nope, nothing. There are machines you can use to do flat embellishing, but unfortunately those don’t help me. So my incredible husband started tinkering with our LEGO TECHNIC bits and bobs to see if he could make something for me. It took about 5 or 6 days of tinkering, building, trials and errors, but he did it. It doesn’t go as fast as the addi Quick (which is 2500 depressions per minute), but I’ll wager it will last a lot longer and the repairs are simple and obvious and the parts are very easily replaced. 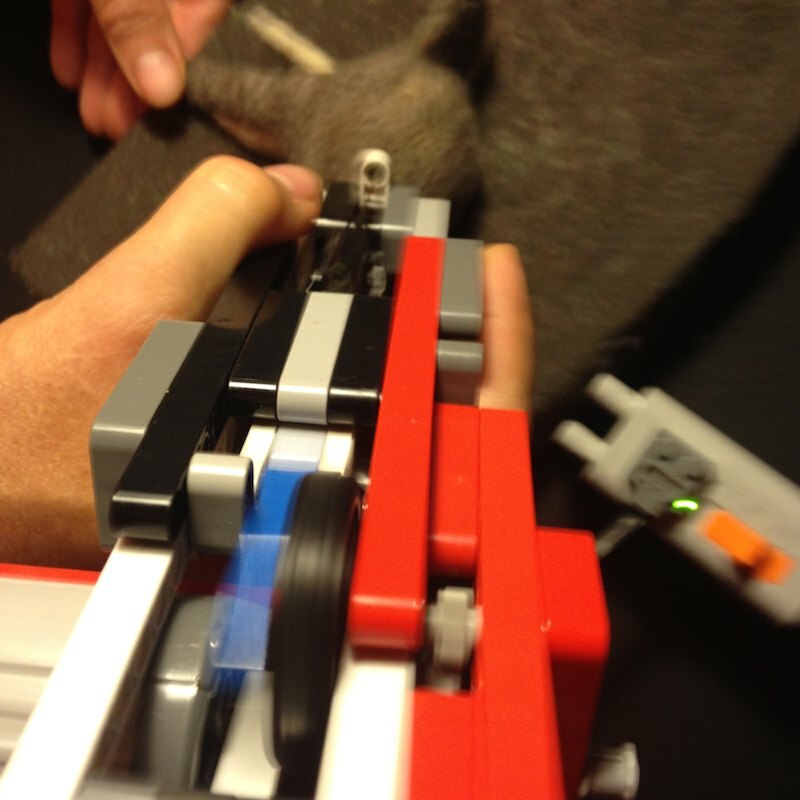 Here’s a photo my son took of the new homemade LEGO TECHNIC needle felter in action the other night. 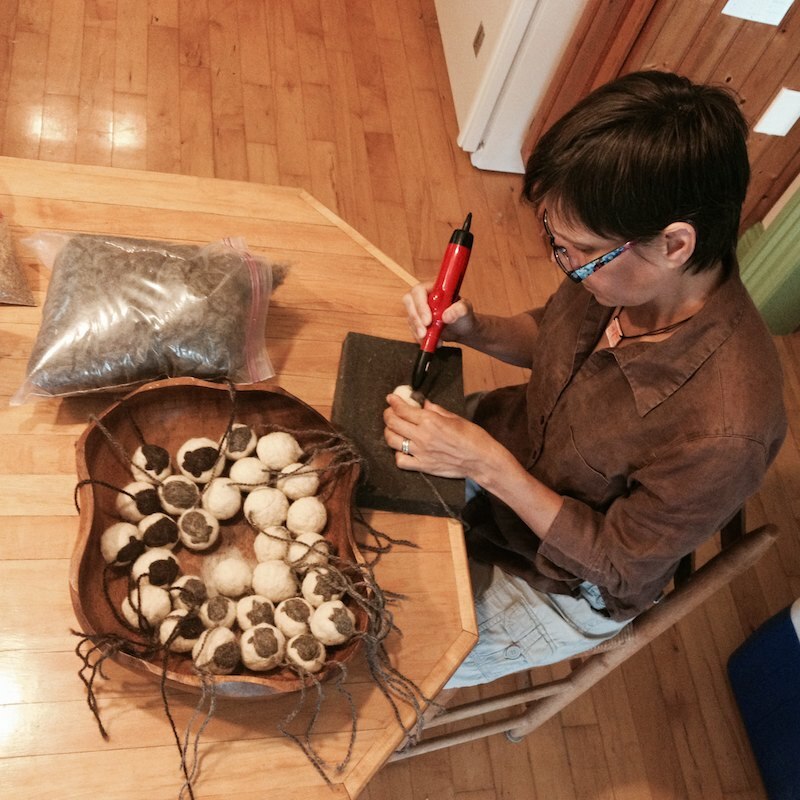 I was felting a layer of grey over a white ball (filling in the bald patches on my elephant). As you can see, I still have a needle sticking out of the bottom of the felting foam. I still have to tack things down manually, but again, this saves me about 50% of the needling I do for embellishments, which is a big deal for my RSI. Yay for LEGO and technically inclined spouses who embrace a challenge! Other great points: this is much quieter than the addi Quick. And it uses standard needles, not specialty needles that you need to buy from addi. And, you know, it’s made from LEGO!!! Everyone LOOOOOOVED that part today.